New Liturgical Movement: Is the Current Communion Fast Really Enough? A few months ago I walked into my parish, and I was a little tired. I had spent a few hours in the middle of the night praying at our local abortion clinic for an end to abortion, as a part of our local 40 Days for Life effort (which I encourage you to check out, and be a part of this upcoming lent, beginning Ash Wednesday). As I walked into the narthex, I went against what I would typically do, and quickly grabbed some coffee that was sitting out from the previous Mass, which had just finished out 15 minutes beforehand. I drank it as quickly as one can drink hot coffee, before heading into the sacristy to put on my cassock and prepare for Mass in the 10 minutes I had before it began. Being Catholic, I knew what to do: as soon as I swallowed the last sip, I looked at my watch, and made a mental note of the time, so I could check an hour later if I could receive communion or not. I know you all have done this at one time or another. It’s a regular part of life for busy people trying to make it to Mass. 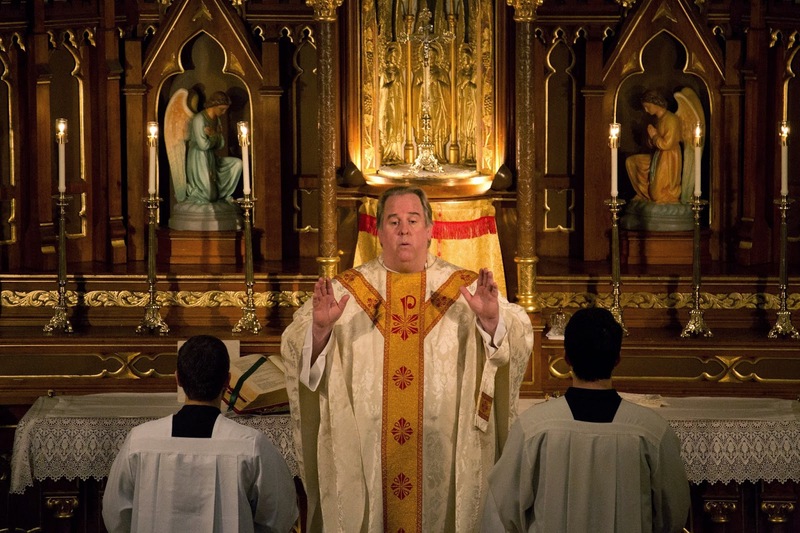 My parish's principal OF Mass on Sunday morning is celebrated as a high Mass each week, with the celebrant singing his parts, with incense and the roman canon used, and when combined with a fair length homily, Mass typically takes about 1:15 most weeks, which is all well and good. In other words, it is celebrated faithfully, with the solemnity that is properly due to the worship of God, particularly on Sunday. As I looked to the clock after the canon had finished, I realized I had already reached the hour mark from when I finished that coffee just before Mass, and I began thinking about how utterly useless our current fasting requirements are on a practical level: I was eating in the back of church just a few minutes before Mass at church, and still fulfilled the fasting requirements. Can you really consider what you're doing a fast if you can eat as you're walking out of the house on the way to Mass? I would hardly call that a fast. Please hear me loud and clear: I am not accusing anyone of doing anything wrong if they eat breakfast, go to Mass, and receive communion and hour or more later. People who do that are following the legitimate laws given to us by the church, and we need not be scrupulous about this. I am not calling their motives or actions into question, rather, I am calling the motives and actions of those who wrote and enacted this law. Traditionally, the fast always began at midnight, which made afternoon and evening Masses very impractical for priests or even impossible for those with health issues or who are aging, as they would not be able to eat all day. Likewise, it made it difficult for the faithful to receive communion at these times as well, so for good reasons, Pope Pius XII modified the fast to three hours, which is a much more reasonable number, allowing Mass to be easily celebrated anytime, particularly in the afternoon and evening, yet still retaining a fast of at least 1-2 hrs before a typical Mass began. If you were to attend a 5pm low Mass following work, you might not be able to eat after 2:30pm, which would be much of your afternoon. That's a fast. Here's what's not a fast: drinking a coffee in the narthex before walking into church. Instead of a fast, it has, for all intents and purposes, been turned into a moratorium on eating during Mass, which is far from a fast, and already a given as a baseline standard of reverence. Fasting, a refraining from food and drink as an expression of interior penance, is something we do which should be a mortification, something at least a little difficult, as a sacrifice to offer to the Lord. This sacrifice of mortification helps prepare us to receive communion by uniting us closer to the Lord. The very concept of fasting requires some level of difficulty and suffering, even if it is small. I strongly believe a 3 hour fast before communion would make much more sense for the church today.